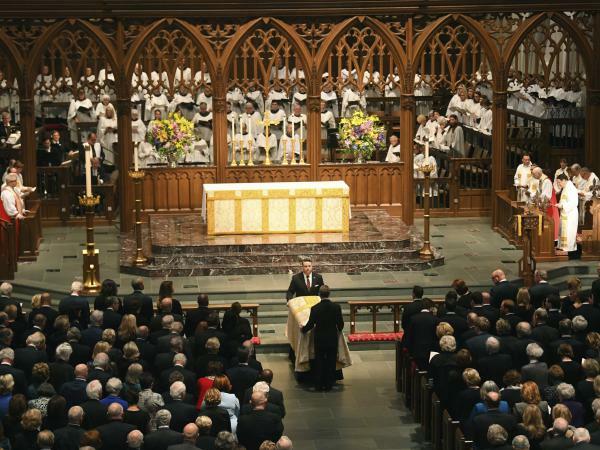 The funeral for former first lady Barbara Bush, who died earlier this week, was held on Saturday at St. Martin's Episcopal Church in Houston. Guests included former U.S. presidents, first lady Melania Trump, ambassadors and sports celebrities. Shuttles brought hundreds of guests to St. Martin's Episcopal Church, the family's church since the 1950s. Former President George H.W. Bush, 93, sat in a wheelchair at the front of the sanctuary, next to daughter Dorothy Bush Koch who at times put her arm against him. First lady Melania Trump was seated in the first row, beside former President Barack Obama, former first lady Michelle Obama and former President Bill Clinton and former Secretary of State Hillary Clinton. The hourlong ceremony started with choir music before a standing prayer. NBC News correspondent and Bush's granddaughter Jenna Bush Hager held back tears before presidential historian Jon Meacham began his tribute. He called Bush "a point of light," describing how she hugged HIV-positive children and an adult at a time when the country was reeling from the AIDS epidemic. The speakers also brought a sense of humor to the celebration of Bush's life. Susan Garrett Baker, wife of former Secretary of State James Baker, spoke of Bush as a "feisty" friend who managed 29 homes in 17 cities. She gave voice to homeless advocates yet was also "pen pals with people she never met," like a young girl who named her heifer after Bush and put the "bovine Barbara Bush" in a competition. Former Florida Gov. Jeb Bush thanked his mother's caregivers, guests and those who had offered their compassion as her health failed. "Our mom was our first and most important teacher," he said. Some of her lessons included kindness and truthfulness. "She called her style a benevolent dictatorship, but honestly, it wasn't always benevolent," he said, as laughter broke out in the cavernous church. The Rev. Russell Jones Levenson Jr., rector of St. Martin's Episcopal Church, said Barbara Bush was humble, courageous and "tired of waiting on the next chapter." He quipped that she lacked patience and was probably already discussing her favorite book, Pride and Prejudice. "My guess is she's already hunted down Jane Austen and has said, 'Well how did things turn out with Mr. Darcy and?' Or knowing Barbara as we all do, she may be telling Jane how things should have turned out." Guests left the service according to Barbara Bush's wishes, singing "Joyful, Joyful, We Adore Thee." After the service, Bush was laid to rest on the grounds of the George H.W. Bush Presidential Library in College Station, Texas.